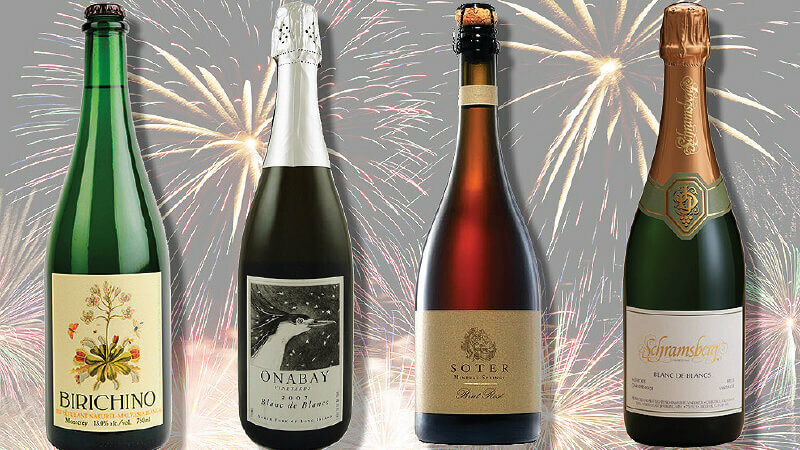 There has never been a better moment to drink some fizz from the US. It used to be that only some wineries made sparkling wine in the US — namely a handful in California owned by champagne houses such as Chandon and Roederer. The traditional champagne process takes a lot of time, equipment and manpower, meaning the bar to entry was always high. But winemakers in the past few years have embraced a style of sparkling wine called pétillant naturel (pet-nat), in which wines finish in the bottle, without the usual addition of yeast and sugar for a second fermentation. A much quicker and cost-efficient process, it’s allowed smaller producers to gain a toehold in the sparkling wine market. Winemaker Randall Grahm has been producing idiosyncratic wines from Rhône grape varieties near California’s Santa Cruz for almost 40 years. This spring, Grahm released his first canned wine, a very lightly fizzy take on the delicate strawberry-scented Le Cigare Volant rosé that made his name. Consider it ready-made for a boat or beach cooler. US$32 (RM129) per four-pack. Made from chenin blanc, this compulsively drinkable wine is low in alcohol (11.5%), with just a bit of sweetness to round out its tangy apricot acidity. While his winery’s in Oakland, California, winemaker Chris Brockway buys fruit from all around the US. Grapes for the 2017 vintage come from Shell Creek Vineyard, an old plot of land in Paso Robles that’s planted on an ancient seabed. US$32 (RM129). Alex Krause and John Locke of Birichino have been turning out exceptional wines from California’s Central Coast for a decade now. Their first wine was made from malvasia bianca, an underappreciated grape. This slightly hazy, sparkling version is a balance of fragrant white flowers and fresh orange peel. US$23 (RM93). Champagne expat Claude Thibaut is responsible for this exceptional, vibrant Chardonnay-based sparkling wine from Virginia’s Monticello. Thibaut, who formerly made sparkling wine for California’s J Vineyards and Iron House, teamed up with his friend Manuel Janisson, the proprietor of the French house Champagne Janisson, to start this small project in 2003. This wine is fragrant and zesty and bats way above its average. US$30 (RM121). Long Island’s North Fork isn’t producing all that much sparkling wine yet, but if what is being made is any indication, it really ought to. Onabay owner Brad Anderson took this project on and assembled a smart team, including his daughter Chiara and winemaker John Leo. This bottling, from a Chardonnay vineyard planted very close to Peconic Bay, has great crunchy green apple fruit. US$22 (RM89). The OG American sparkler, Schramsberg’s been producing this bubbly for more than 50 years, and it’s still a consistently well-priced, elegant wine. Made in the traditional champagne method from grapes sourced in both Napa and Sonoma, this full-bodied sparkler always has an alluring lemon meringue aspect to it — rich and uplifting all at once. US$41 (RM166). As a side project of their winery Bedrock Vineyards, Morgan Twain Peterson and Chris Cottrell are producing single-vineyard sparkling wines. This rosé from the Alder Springs Vineyard in Mendocino County is a delight, full of addictive redberry fruit that’s matched with a tangy mandarin orange flavour. When you find it, buy it. This one sells fast. US$60 (RM242). Made from pinot noir from Tony Soter’s biodynamic Mineral Springs vineyard in Oregon’s Willamette Valley, this sparkling rosé is one of the best American sparklers year in and out. The champagne-method wine is aged four years before it’s sold, resulting in a bubbly that’s fragrant and full of fruit, with little funk. Its textural richness makes for sublime pairing with summer grillables. US$65 (RM263).